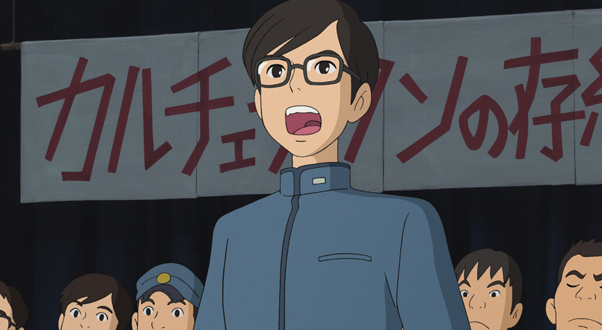 Word trickles along the anime industry grapevine of a rights manager at a film company in a European country that shall not be named, who decided to push for a discount on a Miyazaki film. Lucinda (let’s call her Lucinda) dashed off an email to Studio Ghibli, noting that while their movies previously did good business on film and video, From Up On Poppy Hill was a bit different. It was more of a hard sell; it was more of a niche market, and well, truth be told, she wasn’t sure whether it was a film they could really get behind. Ghibli’s one-word email reply made my day. The minutes ticked by, then the hours, then the days. Eventually, after a tense week, a second email reached the studio from the hapless distributor, saying no more about it, and offering a tidy sum concomitant with previous guarantees for earlier films. I have no idea if the story is true. I repeat it here because, well, my sources have no reason to make this stuff up. It’s certainly a tale that has caused some snickers among Japanese producers and European distributors alike. We can’t really blame Lucinda for trying it on – it’s her job, after all. Nor can we blame a major Japanese studio for raising a quizzical eyebrow at the chances that one of their films isn’t worthy of a place with all the others in the catalogue. But I hear other whispers, too – that one-word, passive-aggressive responses are going to be significantly harder to get away with as time passes. Not one, but two Japanese studios you have heard of are seriously considering reorganising as “legacy” outfits peddling their past glories without taking future risks. The Astro Boy generation have now largely retired, and pension age is already approaching for the masterminds of the video-era boom. Yoshiaki Kawajiri, director of Ninja Scroll, will be 65 in 2016. Katsuhiro Otomo will be eligible for his bus pass in 2019. I predict a couple of big-name studios downsizing in the near future, to the extent they become filing cabinets of contracts. Could Ghibli be one of them? They need to factor the long tail of Miyazaki money against the relative box-office floppiness of Takahata’s latest. Is Ghibli worth more as a legacy brand, in re-releases, merchandise and museum memories, or does it make financial sense to be running it into the ground post-Hayao Miyazaki with diminishing returns? People in meeting rooms are asking this question right now, before they are obliged to be considerably more courteous to the likes of Lucinda. No, really. Jonathan Clements is the author of Anime: A History. This article first appeared in NEO 125, 2014.